Union Minister of State for Petroleum & Natural Gas Dharmendra Pradhan, has asked IGL to increase its business from existing Rs 3000 Crore to Rs 30,000 Crore. He said that approximately 4.5 Lakh vehicles which use CNG contribute to the Rs 3000 Crore business of IGL. Pradhan said, "The IGL currently earns around Rs 3000 crore, and we have to increase its business up to 30,000 crores." Addressing the launch of 'Swasth Saarthi Abhiyan And Fuel Conservation Workshop', a two month long mega campaign, a joint initiative by the Indraprastha Gas Ltd. (IGL) and Petroleum Conservation Research Association (PCRA) focusing on providing preventive healthcare to the auto, taxi and bus drivers of the Delhi-NCR region, Minister Pradhan said that the drivers in the capital region are partners in the growth story of gas used as fuel in vehicles. CNG is used in vehicles for transport, domestic use, autos etc. Pradhan said that these drivers are the lifelines of Delhi, but unfortunately they have very little time & resources for caring about their health. Lauding the hard work of the vehicle-drivers, Pradhan said, "There are 80,000 autos and 2, 50,000 taxis and 1 lakh buses in Delhi-NCR. They earn a business of around 4000 crores. The earning wouldn't have been possible without the role of drivers. I would want the business to increase further. More pipelines should be constructed but the required share should be given to the drivers as well. Arrangements should be made for them as well, because without them, the transport system would not have functioned so well." Members of Parliament, Officials of Delhi Police and other Senior Officials of the Ministry were present during the inauguration of Swasth Saarthi Abhiyan on Wednesday. Pradhan said that the campaign is an initiative to provide basic health check up to the drivers.The SSA event is a unique initiative to address the major issues being faced by public transport drivers of the region, with almost all of them being users of CNG. Pradhan thanked the IGL for initiating the campaign and the Delhi police for providing its support to the campaign. The campaign would continue in form of health camps at various CNG stations of IGL till 31st August 2017. "It would be excellent, if the drivers get the provision of a smart health card", he added. Talking about the ideology of Prime Minister Narendra Modi, Pradhan asserted that nation wouldn't progress, until the people of the lower sections of the society develop. The IGL is planning to provide health insurance which would also include death benefits for drivers in the Capital.The two month long medical camp at various IGL stations in the Capital will provide free health checkup which includes blood test, sugar test, and eye test with the help of doctors from St Stephen hospital. On the Fuel Conservation Workshop, the Minister called upon the drivers to conserve fuel and make use of the workshop to get trained in the fuel conservation methods. Fuel Conservation Workshop was organized by Petroleum Conservation Research Association (PCRA) for drivers as a part of Saksham 2017 - the mass Oil and Gas Conservation Campaign. The campaign is also being supported by Delhi Police to disseminate the message of road safety and responsible behaviour among the drivers. 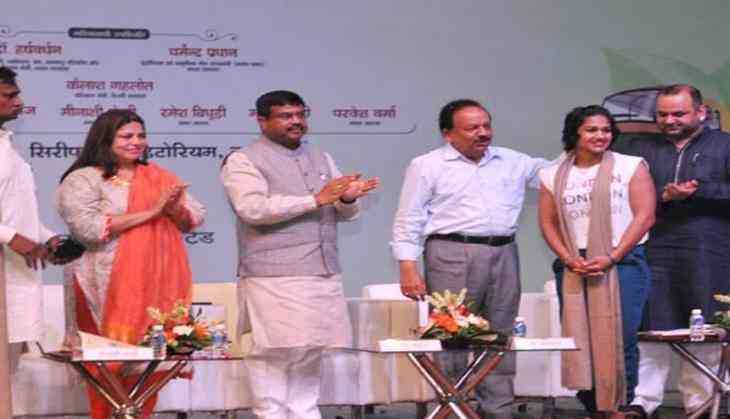 Union Environment Minister Harsh Vardhan, who was also present on the occasion, congratulated the Petroleum Minister and all stakeholders for taking the initiative of SSA and reiterated Prime Minister Narendra Modi's vision of 'Sabka Saath Sabka Vikas'. Wrestler Babita Phogat was also present on the occasion and lent her voice to the campaign for promoting responsible behaviour among the drivers. Road Safety Cell and Women Safety Cell of Delhi Police organized skits and street plays to spread messages of road safety and responsible behavior towards passengers, especially women and elderly. पाकिस्तान से आने वाली इन खबरों का क्या मतलब है?